I am a contemporary fiber artist and quilter who loves color! As an artist, I use fabric, thread and beads to portray texture and try to show the contrast between light and shadow. Techniques such as silk screen, mono printing, batik and fabric painting add dimension and visual depth to my quilted surface. I have created quilted Jewish ceremonial pieces for the home and synagogue. I also enjoy incorporating heirloom textiles into new pieces of fiber art. My work is available for sale and commission.
" 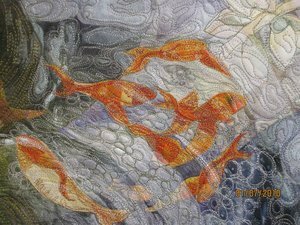 Something Old, Something New"
Koi Study, 12"X 14" This art quilt is one of a series of water studies. I examined the different techniques to portray water on a Koi pond. Hand dyed purple, blue and green fabrics created the pond and layered sheers formed the shadows and depth. Fabric paint and thread work give the effect of water reflection. 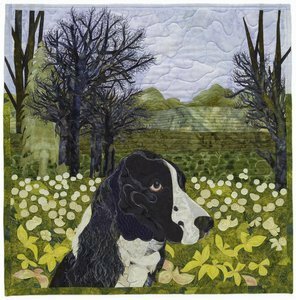 Spring Forward, 27"X 27" This art quilt is a portrait of our Springer Spaniel, Maddie. The dog's head is fused, machine appliqued and hand painted. 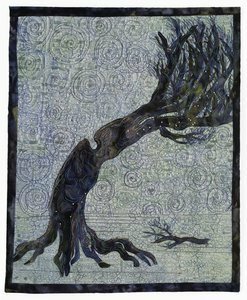 I created the texture of the fur and details of the tree branches with thread painting. Machine quilted by the artist. 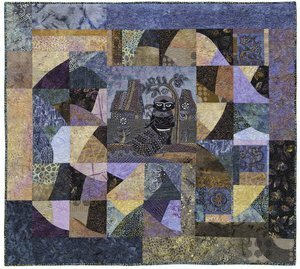 Mother and Child, 72"X 78" A pieced wall quilt with a central batik panel surrounded by curved machine pieced blocks. I was inspired by the colors in the batik panel and used them as a jumping off point to use other commercial and batik fabrics. 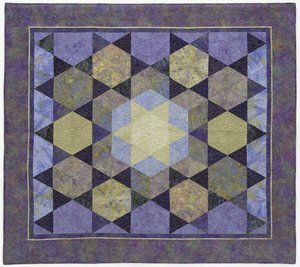 This was machine quilted by George Anna Lunking. Rosh Hashanah Challah Cover, 14"X 16" This is a challah or bread cover used for the Jewish holiday Rosh Hashanah. 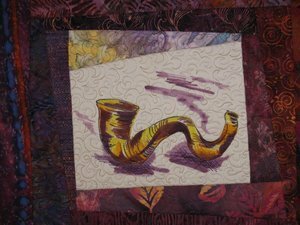 The shofar or ram's horn was hand painted on silk fabric. An off set or crazy log cabin style made up of hand dyed and batik fabrics complete the piece. Machine quilted by the artist. "Snow falls on a Cherry Tree"